The end of the gardening season brings a variety of healthy foods for your family. Are you still harvesting corn, tomatoes, peppers, potatoes, squash and onions? What else do you have still growing? 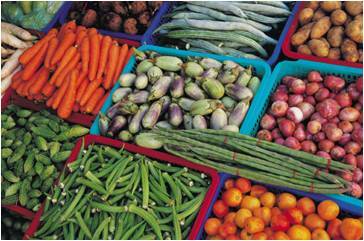 There are many vegetables which are available well into the fall season. Garden vegetables are naturally high in fiber, low in calories and rich in vitamins and minerals which help you feel healthy and energized. Bake a potato for lunch, top with broccoli and a sprinkle of cheese. Boil turnips and potatoes. Mash them together and season with salt and pepper. Steam cabbage and season with caraway seed, salt and pepper. Stir Fry zucchinni, yellow squash, tomatoes, and onions with olive oil and fresh herbs. Saute a variety of different colored peppers and serve as a side dish. Roast winter vegetables such as parsnips, turnips, rutagaga, beets, and sweet potato at 350 degrees for about an hour. Coat lightly with olive oil and fresh herbs and spread in a even layer in a baking sheet. Wrap corn on the cob in aluminum foil and Grill until tender. Author: Linnette Goard, Extension Educator, Family and Consumer Sciences, Ohio State University Extension. Thanks– good ideas for dinner. Makes me hungry for sauteed veggies!